Summary: Stormy next few days are expected, with temperatures starting to cool off. It was quite the stormy night for all of Hickman County as a cold front gave way to a line of thunderstorms that set off impressive lightning storms and lots of booms. We were never issued a warning, but we did get two separate Significant Weather Advisories letting us know that there were some strong storms, but they weren’t yet severe. All of our yards got free watering. Today, our temperatures will be slightly cooler than they have been with a high temperature of about 89 degrees, thanks to last night’s cold front that knocked temperatures down a bit. Clouds are hanging around right now but soon will break up to be mostly sunny skies. Winds will be out of the north at about 5mph. There isn’t a chance of rain today as the cold front brought in a nice high pressure system that is repressing any chances of rain. That high pressure system is what will make tomorrow hot (read on for that). Tonight, our overnight low temperature drops to 72 degrees under partly cloudy skies. Winds will start out of the north at 5mph but chill out to calm overnight. Thursday will be a quick return to the hot temperatures. We will unfortunately experience one more really hot day this week before we get a much deserved break from the triple digit heat indexes. Thursday’s high temperature is expected to be about 95 degrees with a heat index as high as 104. 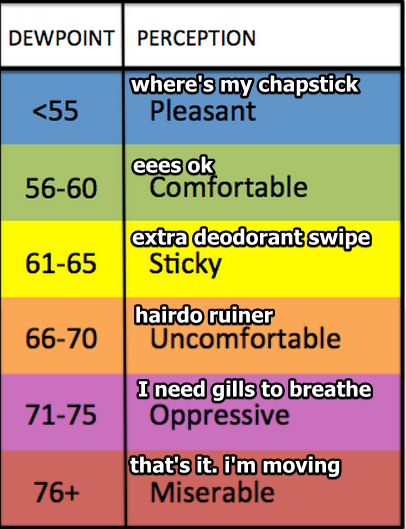 The heat index is the “feels like” temperature when it takes into account humidity. It will “feel like” 104 degrees tomorrow afternoon as the high temperature reaches 95 degrees. 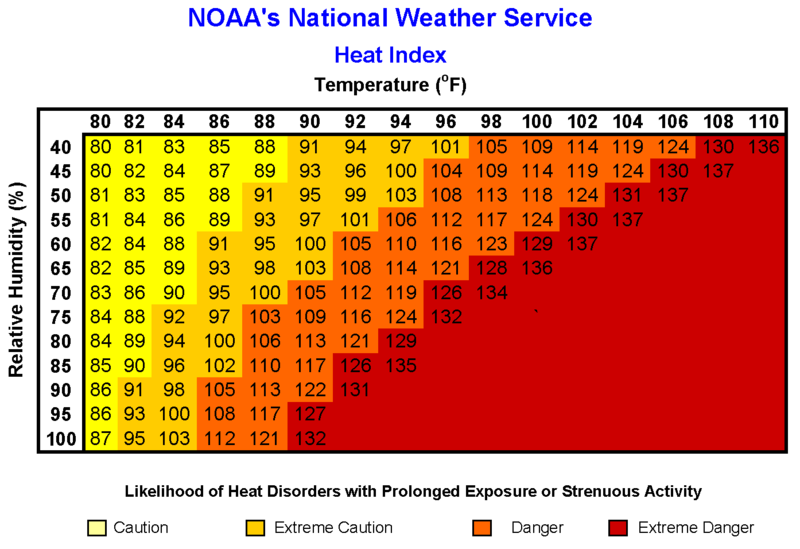 This puts us in the “danger” category according to the NWS Heat Index chart, so be careful and don’t stay out in the heat too much. Stay hydrated and make sure you don’t leave kids, pets or anything living in a car without air conditioning. 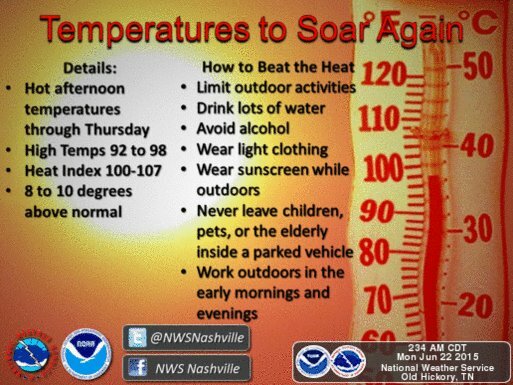 Below are more tips from NWSNashville about staying safe in the heat. Thursday night, our rain chances increase dramatically to 40% chance of rain and thunderstorms with an overnight low temperature of 73 degrees. Friday sees a chance of severe weather in the afternoon. Friday, temperatures take a bit of a dip again to make our afternoon high about 87 degrees. The rain will help with keeping the temperature from going up too much as we have a 70% chance of rain and thunderstorms for Friday and Friday night. 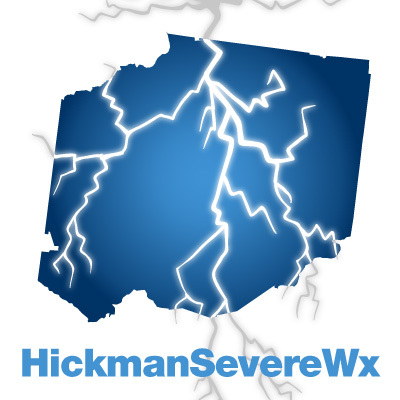 The Storm Prediction Center has already placed Hickman County in the SLIGHT category for severe weather for Friday at 7am (Day 3) through Saturday at 7am. The jet stream will dip and bring the chance of rain and showers that’s been impacting areas north of us for a few days down to us. It will also push out the high pressure system that has made things incredibly uncomfortable with heat and humidity. The main threats with any severe weather on Friday are mainly going to be damaging straight line winds and some large hail possible. 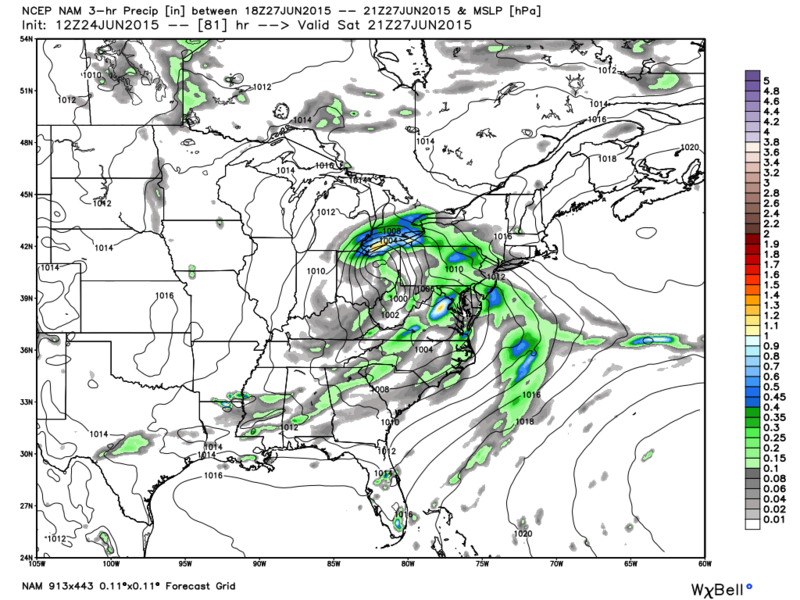 Here’s a glimpse into what NAM12 sees for our weather for Friday at 10pm. You can see along the Mississippi those bright orange and red colors. This shows a line of strong storms coming into Tennessee. This is the line we will be concerned with as we go into the evening and overnight hours on Friday. The weekend starts off wet, but isn’t ruined. The storm activity from Friday night will bleed into Saturday morning giving us a 50% chance of rain and storms mainly as we are waking up. Our high temperature Saturday is going to be a very pleasant 77 degrees. Saturday night sees a 20% chance of rain and thunderstorms with an overnight low of a chilly (compared to recent lows) of 62 degrees. 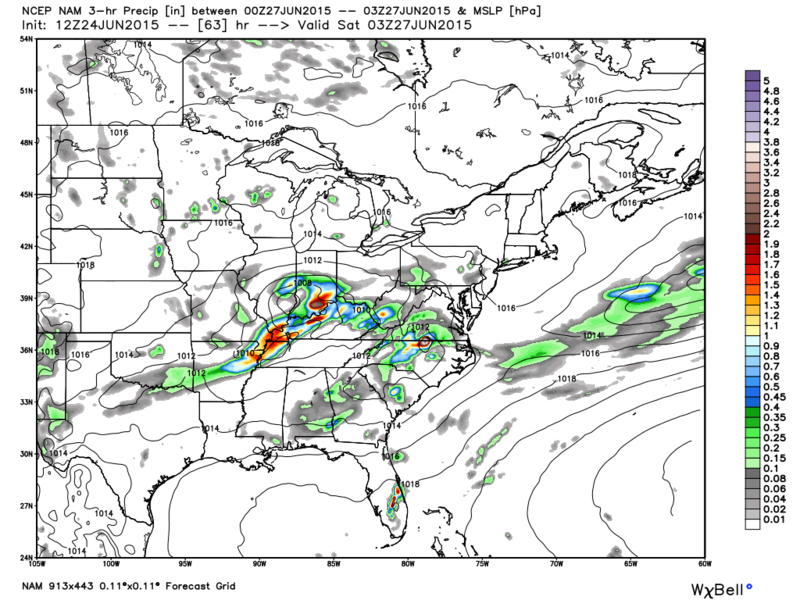 Rain chances may linger into Saturday afternoon a bit, according to NAM12. Sunday will be a perfect June day with a high temperature of 81 degrees under mostly sunny skies. Will the heat wave return? So, will the heat ever get as bad as it has twice in the last two weeks? 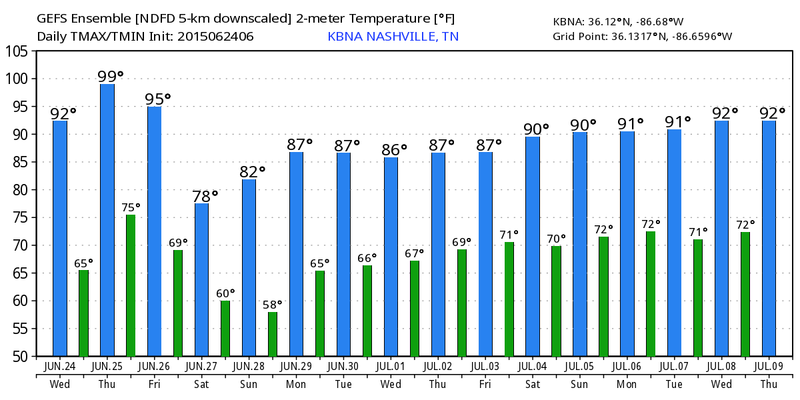 Taking a WAY WAY WAY out look into the future, it looks like temperatures will start reaching the lower 90’s around Fourth of July and after. This, however, is subject to change as it does look 16 days into the future.